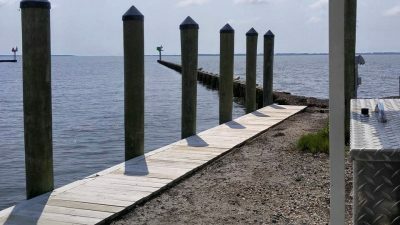 George, Miles & Buhr, LLC (GMB) provided engineering services for the redevelopment of the Greenbackville Harbor in Accomack County, Virginia. The project included improvement to the harbor’s boat ramp, boarding piers, and protecting the bulkheads system. The bulkhead replacement utilized vinyl sheeting with timber wales and vertical piles. The improvements improved the waterfront access for local and regional recreational fisherman and also the harbor’s continued use and enjoyment by both local residents and visitors alike. GMB performed a facility assessment of the different marina components. GMB provided a written report that summarized the findings of the assessment including options for replacement versus repairs of the various components. Assisted the county with grant applications for the following programs: Saltwater Recreational Fishing Development Fund, Virginia Port Authority, and Boating Infrastructure Grant. GMB provided bid package documents for soliciting bids from contractors. GMB attended pre-bid meetings, pre-construction meetings, project site visits, and a final walk through of the project.